Basing on the strange and different style and decorative patterns, art researchers thought the printing woodblock is over 50 years old. However, the artisan Ky Huu Phuoc supposed that this block of lightweight wood in such a carving style must have been more than 100 years old. 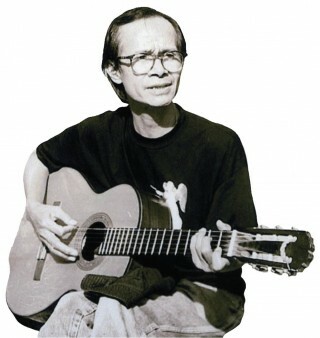 1 - In 1999, after the historic flood in Hue, the artisan Ky Huu Phuoc, one of the remaining printers and engravers of Sinh Folk Painting Village (Phu Mau - Phu Vang), informed researchers that he had found a printing woodblock of worshipping painting, similar to the one of "Boy Holding Pen," which had so far been used, but there are some differences as well. 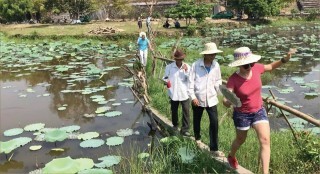 The woodblock was then carefully cleaned and dried and given to an artist and lecturer at Hue College of Arts who had for many years studied Sinh folk paintings for worship. 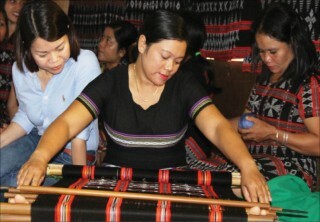 Since then, that woodblock has been kept at the college and many times been restored for display and interaction with visitors at Hue Traditional Craft Festivals. 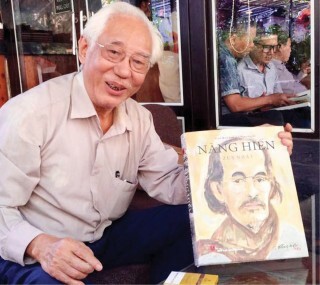 In November 2016, the woodblock was brought to Hanoi for display at the workshop on Vietnamese folk paintings, organized by Hanoi Museum and Hanoi Pottery Museum and soon caught great attention of artisans in Dong Ho and Hang Trong. The woodblock is 35cm long, 12cm wide and 2cm thick, made of beech wood. Though it was soaked in muddy water for many years and looks very old, it is still in good conditions. Generally the carving strokes on the woodblock are still sharp and delicate except some worn-out and missing ones. The woodblock depicts a boy with an innocent, cheerful and friendly face. He is wearing an old-styled Vietnamese male ao dai (long dress) with bare head and bare feet. His hair is fussily combed into two waving parts. He is holding a pen in one hand; the other rests naturally on his belly. The strange thing is, on the collar, there is a flower which bends down, almost touching the pattern on the chest in the shape of a "no beginning, no ending" knot, familiar in Hue Buddhist decorative style in the 19th century. The same pattern can also be seen on the front lapel of the long dress, creating a different and strange style of decoration. Moreover, the perimeter of the printing woodblock connects naturally with the curve of the collar, the vertical form of the long dress, the sleeve, the lapel and the zigzag patterns on the pen. The entire figure looks clear, vivid and innocent. Unlike most of the Sinh paintings which are often rectangular in shape, this picture is in the shape of the figure. The pen and the face are linked to perfection, creating a strong and enduring look. Basing on the strange and different style and decorative patterns and such a block style, art researchers thought the printing woodblock is over 50 years old. However, Mr. Ky Huu Phuoc, an artisan with many years' experience, supposed that this block of lightweight wood in such a carving style must have been more than 100 years old. 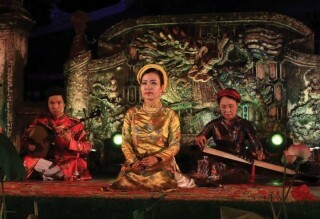 2 - So far, researchers have not paid much attention to this printing woodblock, but through a province-level research on Sinh folk paintings, a group of lecturers at Hue College of Arts recognized its uniqueness and originality when comparing it with the other ones being used. Since the finding of this printing woodblock, the artisan Ky Huu Phuoc has a couple of times restored and replicated the image of the boy holding a pen on gỗ mứt, a kind of anti-termite wood that is lightweight, durable and with very fine wood grain, suitable for engraving. 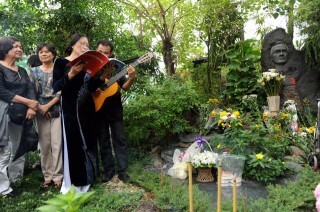 However, Phuoc has never had it cut into the original shape because it is so complicated and inconvenient for printing. Since then, besides the much-used woodblock of Boy Holding Pen, there has been this new woodblock to diversify the system of printing woodblocks for worshipping painting in Sinh Village. Obviously, the woodblock of "Boy Holding Pen" belongs to the category of sacrificial painting, very familiar in the spiritual life of Hue residents. Ancient Hue people believed that when a child was suffering from an incurable disease or when they were informed in a dream about something bad, they often gave a sacrificial ceremony. The offerings often included boiled eggs, worshipping paintings, painting of Ba Can Thac, painting of bow and arrow, offering banknotes, etc. They prayed for blessings then burnt the paintings, hoping that the child would recover. 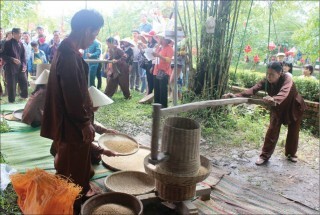 It can be said that this type of sacrificial painting is of unique worshipping function of people in Sinh Village, of Hue people in particular and Central people in general. Today, people still use this type of painting in ceremonies to pray for peacefulness, blessings and safety. However, the rituals are now simpler than before. 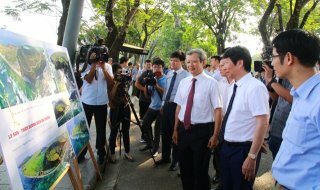 This type of painting also catches the attention and interest of tourists because it helps them understand the original spiritual life of ancient Hue people, also a unique feature of Vietnamese traditional culture surviving until today.